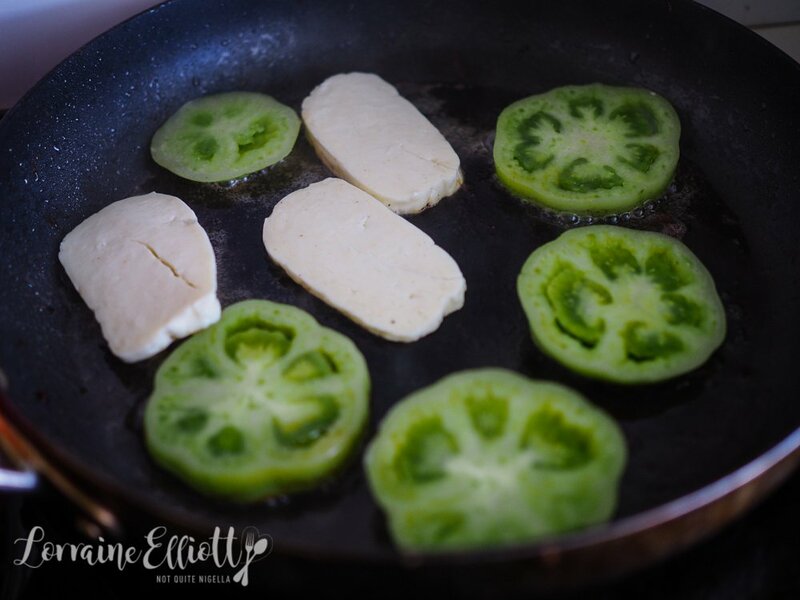 Green Genie: 4 Delicious Ways to Eat & Cook Green Tomatoes! 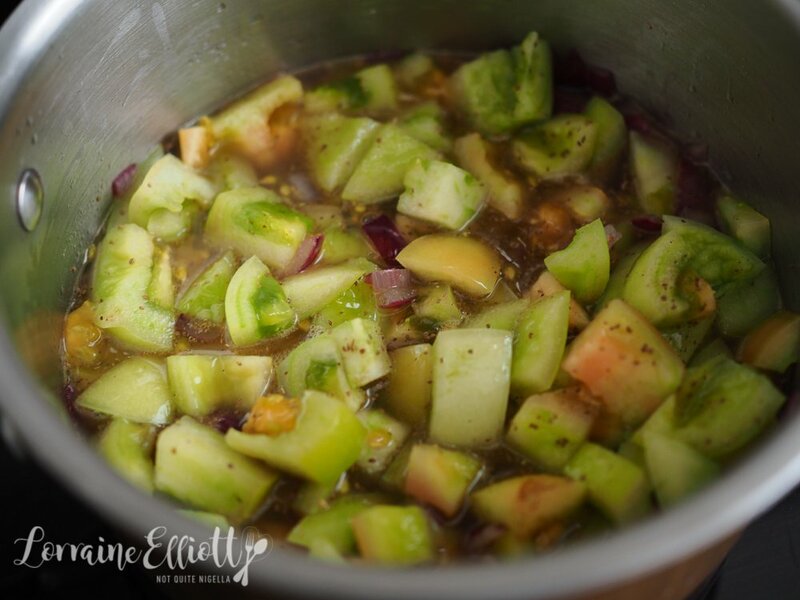 With summer coming to a close you may have more green tomatoes than you know what to do with as green tomatoes pop up in garden beds and at markets! 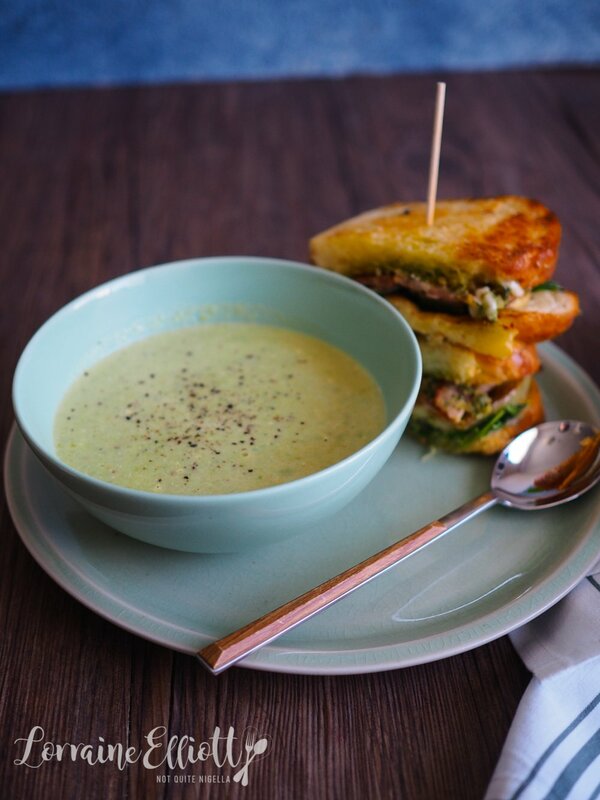 Of course there's the classic fried green tomato but there's so much more to do with them. 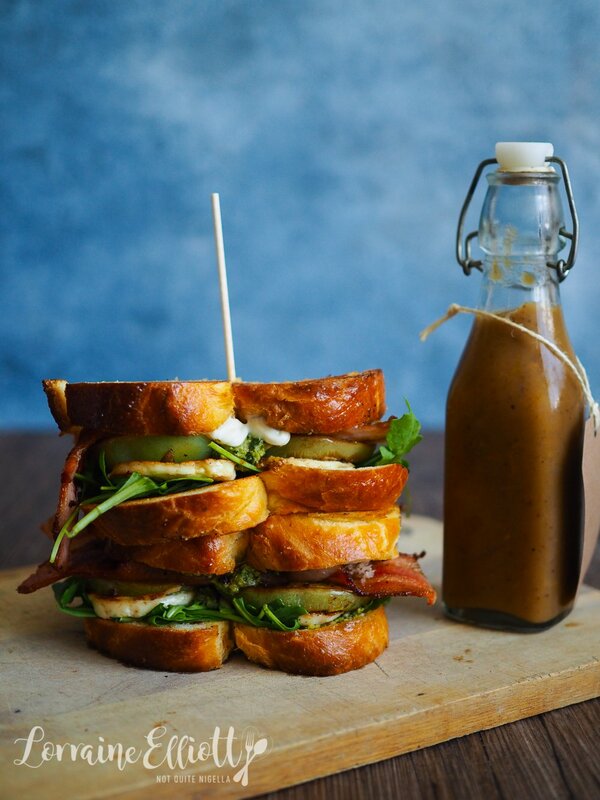 From an amazing green tomato ketchup, green tomato & feta salad, a BLHT (BLT with Halloumi!) 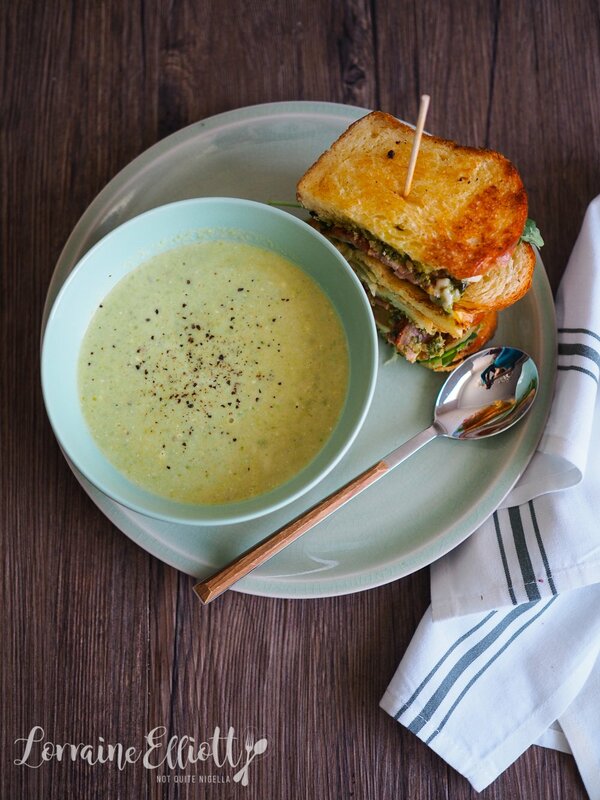 using green tomatoes and a creamy green tomato soup you may find yourself seeking out green tomatoes! Green tomatoes have a lovely crisp texture although they aren't sweet like ripe, red tomatoes. I found that pairing them with sweet flavours goes well but they're surprisingly versatile. 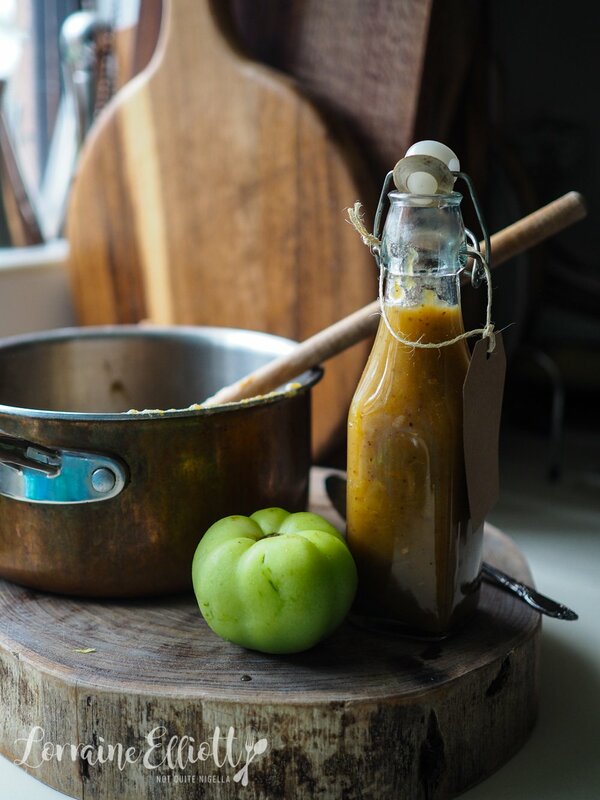 I made these recipes on a weekend when I was home alone and had a bucket of these green tomatoes to play with. We bought them from a greengrocer and I got a bit too excited when I saw them. And I am such a nerd that the idea of spending a whole day playing with green tomatoes was what I considered fun. Mr NQN was doing a windsurfing camp that weekend. He asked me if I wanted to come but the invitation came with some hesitation. Neither of us want to see me camping quite honestly. I don't want to do it, nor does Mr NQN want to have to deal with me when I complain that my creature comforts are missing. It's better that I am comfortable and away from tents. He went off to do his windsurfing, proudly getting blisters on his hands like trophies. As for me, I had m ideal weekend alone. I made some recipes with green tomatoes, ate dumplings and salad and drank kombucha and by 8pm I was settled into bed and I finished my book ("Bad Blood" by John Carreyrou about the Theranos scandal, you've got to read it, it's outrageous and compelling). So tell me Dear Reader, what is your idea of a great weekend alone? 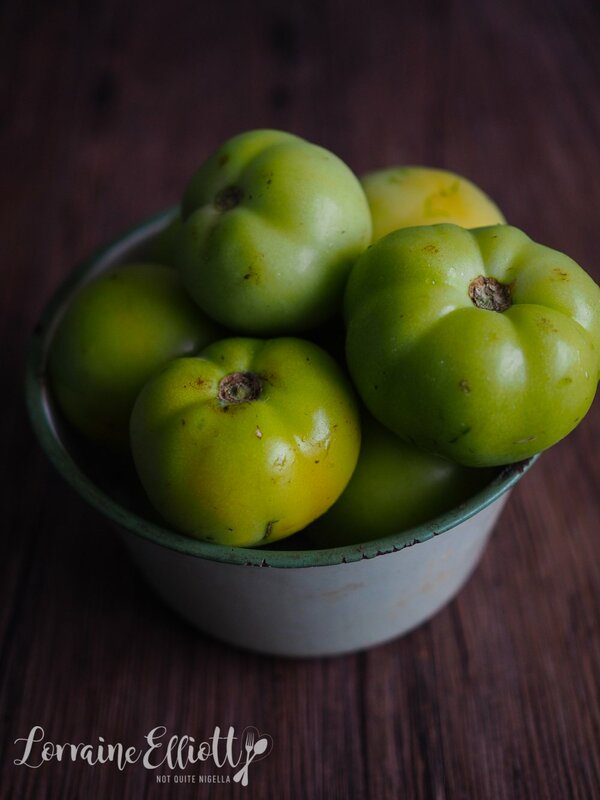 Have you ever tried green tomatoes? 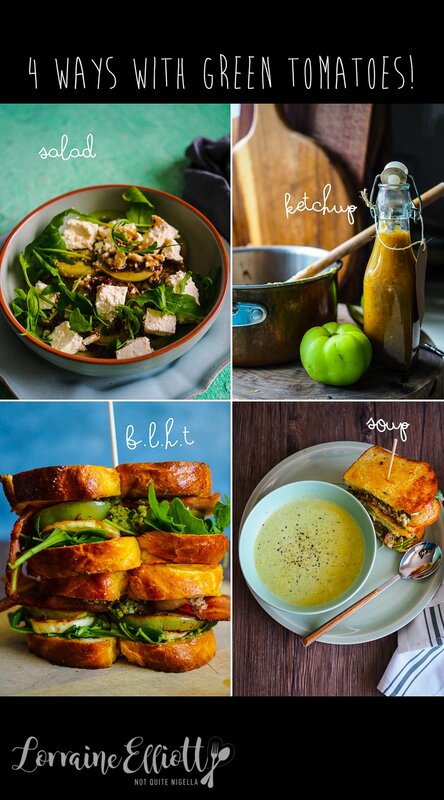 Which recipe appealed to you the most of the four? And have you read Bad Blood? 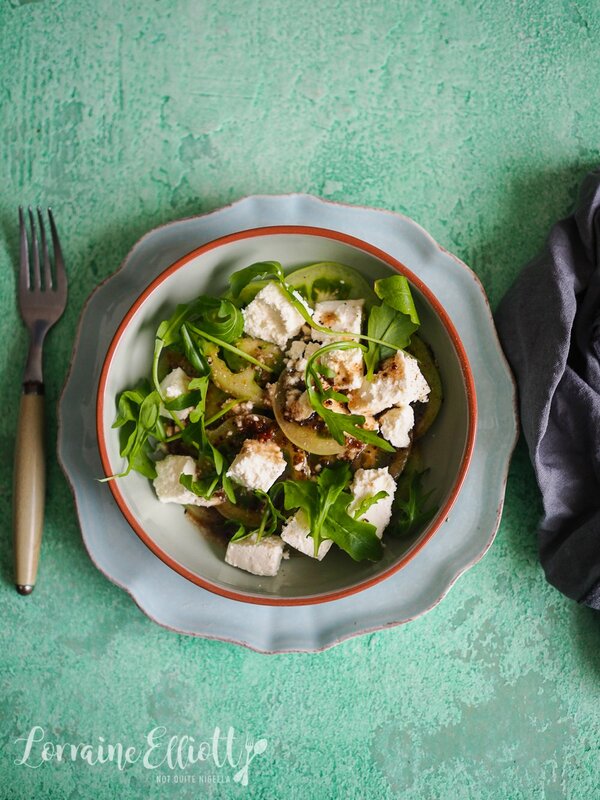 Step 1 - Cut the tomatoes into thin slices and then fan out in a bowl alternating with feta and rocket. 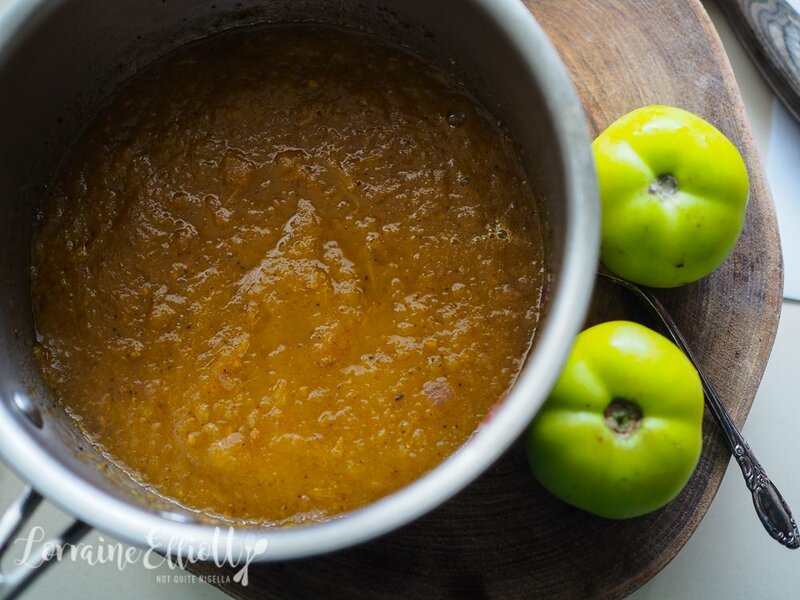 In a small bowl or a jug whisk the oil, vinegar, honey and mustard together until emulsified. Pour over the tomatoes. Season with salt and pepper. 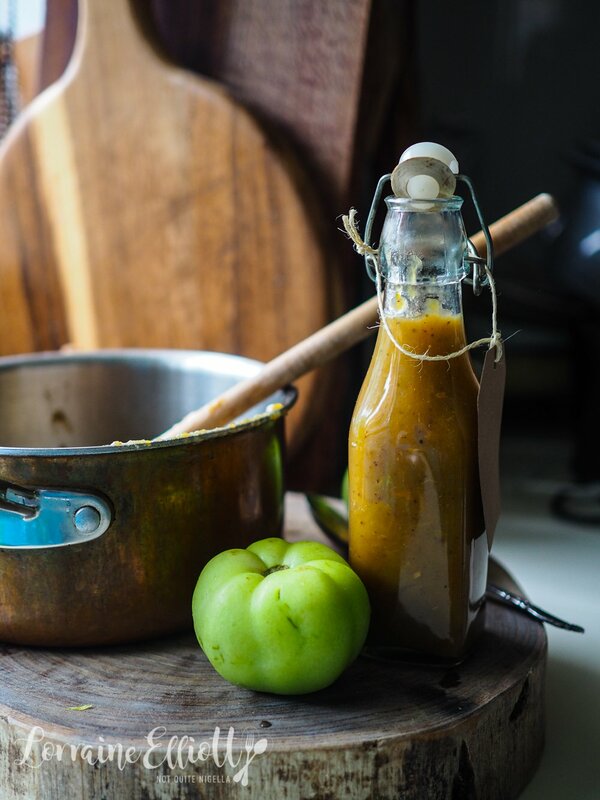 Double, triple or quadruple or more this recipe because it is delicious and once you've got one lot cooking you may as well start bottling this stuff it's that good. Step 1 - Heat the oil in a saucepan and saute the onions on medium heat until soft. Add the tomatoes, vinegar, sugar, celery seeds and cloves and bring to a boil. Step 2 - Simmer on low heat with the lid on for 1.5 hours. Once the tomatoes are soft, remove the lid, turn the heat to medium and allow the liquid to reduce and then use a stick blender to blend to a smooth consistency. Taste for salt - I just added a little to bring out the flavour. Step 1 - Butter the outside of the brioche and set aside. Fry the bacon until crispy and remove from the pan. Add the halloumi and green tomatoes and fry until done. Scrape the base of the frypan and then take the brioche slices butter side down and fry until golden. Step 2 - Take one piece of bread and add some rocket. 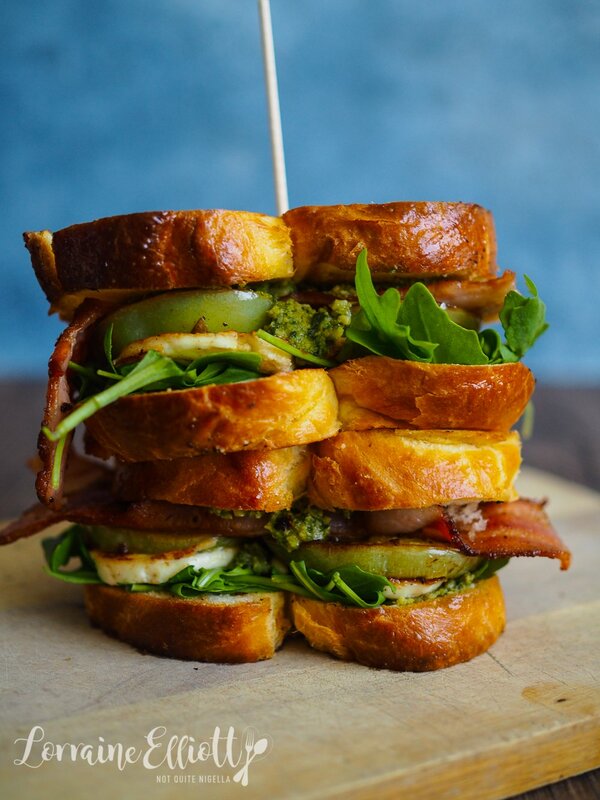 Layer green tomato slices, halloumi and bacon adding pesto and aioli to taste. Place other slice of brioche on top and serve. Step 1 - Preheat oven to 180C/350F and line a baking tray with parchment. 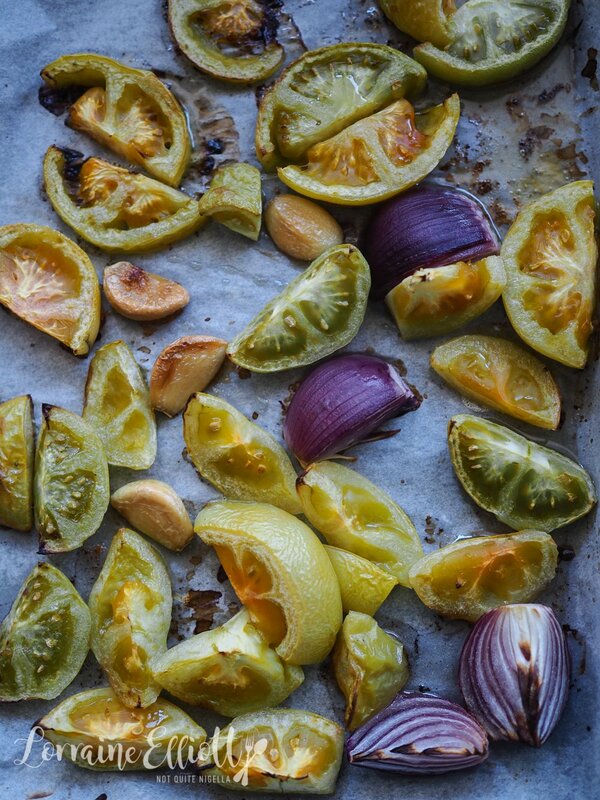 Place the onion, garlic and green tomatoes on the tray and drizzle with oil. Roast for 30 minutes. Step 2 - Place the chicken stock and peas onto boil and add the roasted vegetables. Simmer for 10 minutes and then blitz using an immersion or stick blender. 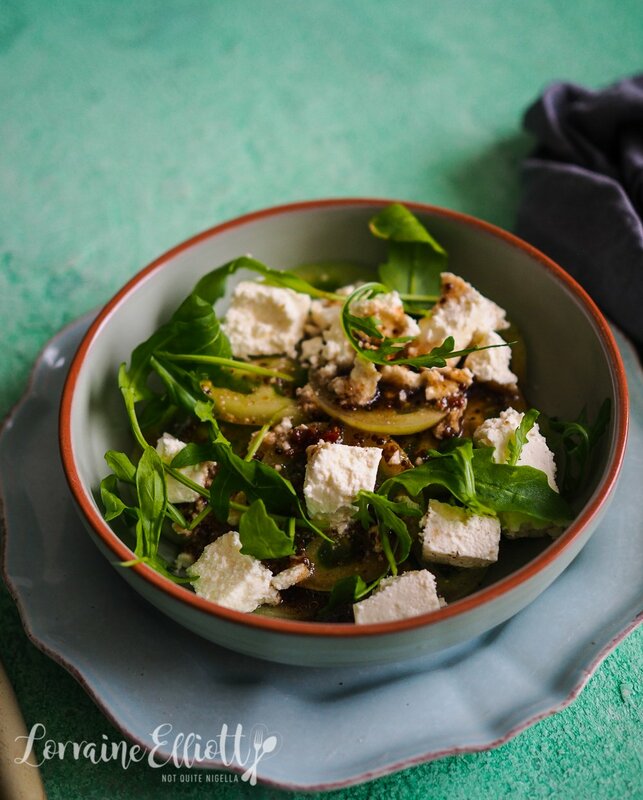 Add cream and feta and season to taste.